Is there a place in your home that can help you feel balanced, grounded and more together? We know that Feng Shui offers the promise of utilizing the energy of our homes to unravel and achieve many things in our lives, but one spot marks the synthesis and culmination of all your focus and effort. It is the Center Bagua area, and it holds the key to so many puzzles. 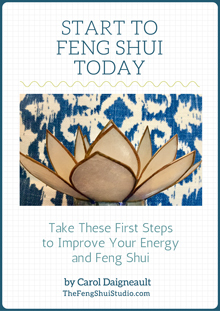 Get you FREE DOWNLOAD of my Feng Shui Bagua Map. The Feng Shui Bagua is one of the primary tools of Feng Shui. This nine section grid is superimposed over your home’s floor plan, essentially “mapping” the major influences in your life such as wealth & prosperity, relationship and career. Each individual area (or gua) identifies the part of your home that represents and holds the energy of this influence. So, if your Wealth & Prosperity area is in the kitchen, you can examine and work with the physical features, decoration, function, maintenance and organization of your kitchen to improve your finances. To find the Center in your Feng Shui home, download your Free Feng Shui Bagua Map, complete with instructions on placement. My multiple post series on The Feng Shui Bagua offers additional insights including how to read your Bagua Map. For now, begin to decipher the approximate location of the Center of your home. Then you can be thinking about how the insights that follow can relate directly to you, your space and your life. The Center is the heart of the home. It is considered a neutral area, having its ideal to express a perfect balance of Yin and Yang. When you take a look at the Feng Shui Bagua Map, it becomes apparent that the Center area is in the middle of all the action. Each of the surrounding guas has their own individual role to play. They all work together as vital Ch’i energy in each builds and travels to the adjoining areas. Eventually it all comes together as this nourishing and supportive Ch’i circulates and gathers in the Center where the process is reversed. Thus, a vibrant Center is the epitome of good Feng Shui, producing a constant, gentle, auspicious supply of wonderful energy to all the home’s occupants. The Center gua is home to the Earth element and the concept of being grounded. 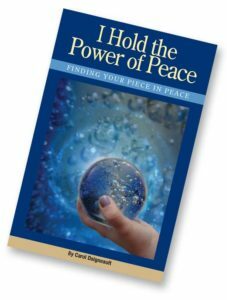 When all aspects of life are in their right proportions, we will feel at peace. The Center represents this ideal. Here lies the promise and result of our efforts to integrate all parts of our life. Hence, when we create balance and flow in the Center of our space, we both feel and experience personal integration and harmony. We reach this point by practicing Feng Shui on multiple levels. Creating spaces that support and nurture us with a smooth Ch’i flow is the first aspect. We couple these actions with the personal work of using the Bagua to set intention as well as developing our own individual Inner Feng Shui with meditation, visualization, relaxation or other personal empowerment skills. This gua also oversees all areas of life not represented in the other eight guas. When it appears that many aspects of life are out of harmony, check first to see that the Center is in balance. The Feng Shui Bagua Map gives us a system to work with the Ch’i energy in our homes to help us achieve our goals. When we pinpoint either a personal concern or ambition, turn to the Feng Shui Bagua Map area that best expresses the essence of our quest. Then adjust the space to hold a more full expression of that supportive energy. Begin to Feng Shui your space to achieve your intention for your Center by placing a Feng Shui adjustment in that part of your home. These adjustments serve to balance by generating new, vital Ch’i that will support you to move closer to achieving your intention. I have experienced both my own and client’s Feng Shui adjustments create opportunities and circumstances that not only achieved, but surpassed, our original intentions. Give it a try in your own home and see what happens! Ceramics, the Tai Chi symbol and porcelain tile are all appropriate enhancements for the Feng Shui Bagua Center gua. The Center gua is considered by many schools of Feng Shui to represent Health. You may have observed on the Feng Shui Bagua Map above that Health & Family is noted in the left hand, middle gua. Why the discrepancy? As an Essential Feng Shui Practitioner®, I was taught to look at the Health and Family gua for overall health issues. That approach has been quite helpful and sound. Through observing scores of structures and their occupants over the years, I have also come to associate the Center gua in addition to the Health and Family area when assessing overall health of a home’s occupants. Add a square or rectangular area rug to the Center to quickly ground and balance a space. Also look to the Center gua as “backup” for virtually any other situation in which you seek improvement. When you have worked with another Bagua area, applied your Feng Shui adjustments but not observed adequate results for the situation at hand, take note of the Center. Remember, the Center is the epicenter of all the Ch’i energy of your home and, hence, your life. Imbalances in the Center gua may be creating some overriding energy drain, blockage, acceleration or uneven Ch’i flow. In certain occasional instances, this could be making it challenging to adjust the outlying guas. Should you think this might be part of your Feng Shui challenge, it may also be time to contact me for your own personalized Feng Shui consultation. A little time devoted to our working together to diagnose your home’s Feng Shui concerns then receiving, and performing, specific Feng Shui adjustments, can reap positive, life enhancing results. I’ve seen it happen again and again with my clients. 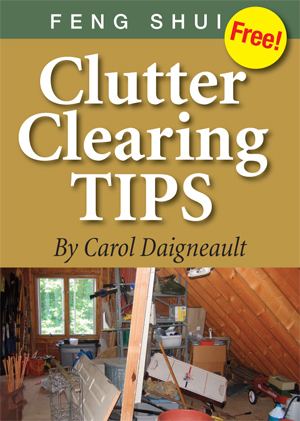 You can start to move forward today by identifying and assessing your home’s Center area. Share any questions or insights below so we can all benefit from your discoveries and utilization of the ancient wisdom of Feng Shui.